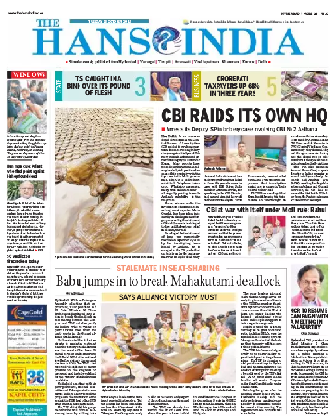 The Hans India, an English Daily published across Andhra Pradesh, New Delhi and Telangana, . The newspaper was launched in 2011 and publishes editions from Hyderabad, Visakhapatnam, Amaravati, Rajahmundry, Khammam, Kurnool, Nizamabad, Tirupati, Warangal ans in New Delhi simultaneously, the newspaper is on its way to becoming the leading English Newspaper in Telangana and Andhra Pradesh. They are soon going national too. The Newspaper is owned and operated by Hyderabad Media House Ltd, which also runs the Telugu-language news channel, HMTV. In a nutshell, we closely highlight socio-economic development of India in general and the two Telugu states in particular. With book my ad, you can book your business ads, property ads, matrimonial ads, tender ads and many more at discounted rates. With us you can make your advertisement reach out to people all over the nation on a big scale including major cities like Hyderabad, Warangal, Khammam, Telangana, Vijayawada, Visakhapatnam, Tirupati, Kurnool, and many more other cities like these. Contact us for best packages and discounts.